76ers swingman Evan Turner is suffering from right knee soreness. Turner, who sustained the knee pain in Saturday’s 116-106 loss at Milwaukee, “did pull up lame today,” coach Brett Brown said. The fourth-year man was on the court briefly Sunday, as the team went through a light practice that largely involved stretching and recovery conditioning following games on back-to-back nights. Brown said Turner would be a game-time decision if the Sixers had a game in the near future. Given that the Sixers (8-20) don’t play again until Saturday in Phoenix, Brown sounded optimistic that Turner shouldn’t miss any time. 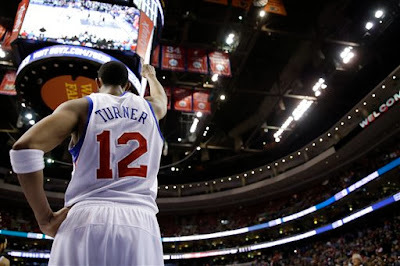 Turner, the Sixers’ leading scorer, is averaging 19.3 points, 6.6 rebounds and 4.1 assists. He’s the only player to have appeared in all of the Sixers’ 28 games. 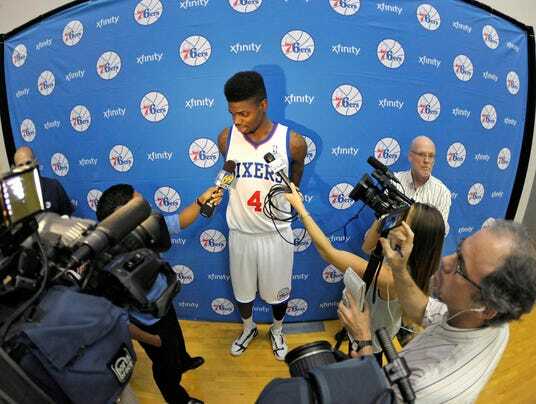 NEW YORK – 76ers rookie Nerlens Noel said “there’s a possibility” he could play this season. In an interview Monday for the NBA channel on SiriusXM Radio, Noel said no decision has been made regarding his availability this season. Noel has been viewed as a longshot to play while rehabbing the torn ACL in his left knee that he incurred in February 2013 as a freshman at Kentucky. Sixers coach Brett Brown has said that he looks at this season as an opportunity to reconstruct the mechanics on Noel’s shot. So there’s a possibility he might play for the Sixers? “There’s a possibility,” Noel said. Noel, 19, has not spoken to reporters since the team’s Oct. 1 media day. Reporters have been told Noel is unavailable for interview requests until he’s cleared to participate in 5-on-5 practices. The Sixers (7-18) visit the Brooklyn Nets (8-15) Monday night. The 76ers’ Daniel Orton has been suspended one game without pay for his involvement in a scrum in Saturday’s 139-105 loss to the Portland Trail Blazers. Orton will sit out Monday’s game at Brooklyn. 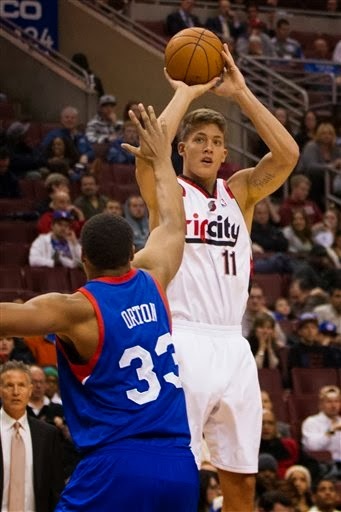 The incident occurred with 7 minutes, 19 seconds left in the fourth quarter, when the Trail Blazers’ Meyers Leonard body-slammed Orton to the ground. Orton retaliated while both were in a heap, throwing an elbow that hit Leonard in the mouth. Both received Flagrant 2 fouls and were ejected from the game. The Portland Trail Blazers brought to Philly a familiar face, in Dorell Wright. 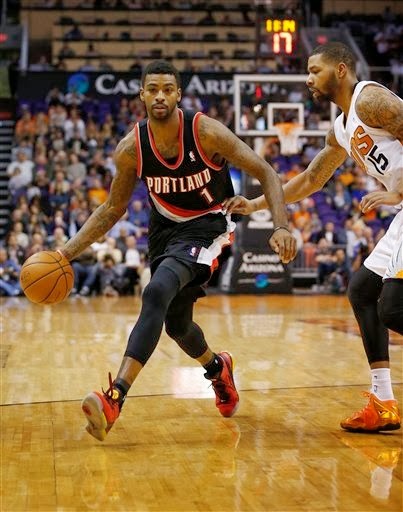 Wright, who spent last season with the 76ers, got a two-year, $6 million deal in the summer from Portland. That’s a pay cut for the 10th-year swingman, who made more than $4 million for his work with the 2012-13 Sixers. Still, it’s more than the Sixers were willing to offer Wright, who averaged 9.2 points and shot 39.6 percent last season. “There was nothing,” Wright said. That being said, the grass in the Rose City isn’t always greener. Wright, who’s playing with an unspecified bench role for the Western Conference-leading Blazers, is averaging fewer minutes (14.2) than all but one season in his career. He’s averaging 4.9 points and 2.5 rebounds in 23 appearances, with zero starts. Also, he’s shooting 34.9 percent from 3-point range – his lowest total from beyond the arc since 2006-07. Wright said he’s stayed in touch with current Sixers Evan Turner, Spencer Hawes and Arnett Moultrie, as well as deposed coach Doug Collins. Wright has no regrets from his one season with the Sixers, a team of shooters assembled around anticipated centerpiece Andrew Bynum.